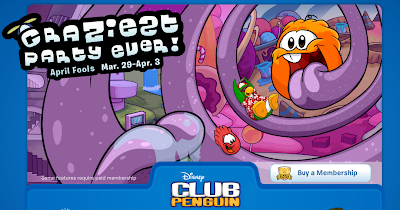 Club Penguin Cheats by Mimo777 Club Penguin Cheats by Mimo777: Club Penguin April Fools Start Up Screen! Check out Club Penguin's saweet new start up screen to promote the April Fools Party! Looks totally warped, don't ya think? EPIC!!!!! LOOKS LIKE THE BEST 1 YET!!!!!!!!! !